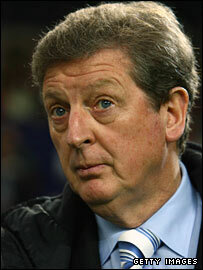 Finland manager Roy Hodgson has played down his chances of receiving an approach over the vacant England post. Hodgson came close to taking Finland to the Euro 2008 finals and the Finns won 24 points in Group A, in comparison to England who won 23 points in Group E.
"I don't want to be seen as saying Roy Hodgson wants the job, or Roy Hodgson doesn't want it," he told BBC Sport. "I'll only give my opinion if I receive an offer or an invitation to speak to someone." Feature: What has gone wrong for England? Hodgson, who is a 40-1 outsider to succeed Steve McClaren, added: "The FA might be laughing at some of the people suggesting that they might want the job. "The FA might be thinking: 'Who the hell does he think he is - we'd never give it to him anyway'. I'd hate to be in that position. "I think the FA has a job to do and all I can do is wish Brian Barwick well and it's not my business really. "It's ridiculous people saying I'm available, or I'm not available, when we've no idea what the FA is thinking. "But I'm proud of what I've done. I've had 32 qualifying games with Switzerland and Finland and lost four of them." Hodgson, who has also been linked with the vacant Republic of Ireland job, said he had had no contact with the FAI, the English Football Association or the Scottish FA, another body looking for a new coach following Alex McLeish's resignation. However, former Blackburn manager Hodgson did reveal he was approached by the Northern Ireland FA when Lawrie Sanchez left to join Fulham last season, but opted to stay with Finland. Hodgson's contract with Finland expires at the end of November and the Finns have called a media conference on Friday to clarify the Englishman's future. "My contract runs out at the end of this month, but I haven't made up mind yet what I'm going to do," said Hodgson, who has been invited to attend a coaching convention next week in Brazil. Who would be your England managerial choice? "We've been negotiating for a while and they've been attempting to get me to stay. We're still discussing it, but my future is very open and I haven't committed myself to the next two years." Hodgson led Switzerland to the World Cup finals in 1994 and has also coached club sides Inter Milan and Udinese in Italy as well as Blackburn Rovers. "I'm not working in the public eye and concentration I suppose is bound to be around the candidates the FA see and hear every day. "I work abroad and my name isn't always brought to people's attention. "But I've been very satisfied with the job I've been doing over the years and my record is as good as anyone else. "I feel neither the need to push myself forward or to behave like a shrinking violet. If people want to speak to me I'm sure they'll find me. "I don't want to be one of those people putting their name forward. "The last thing I want to do is put myself in the frame or take myself out of the frame as I've no idea how high or low my shares are with the people who are making the decisions. "But I can only echo Sven-Goran Eriksson's sentiments. When people from either top federations or big clubs want to speak to you it's very foolish not to do so. "I don't have an agent or anyone touting my name around England. "I've been very lucky in my career over the last 32 years in that jobs have found me rather than I have found them and I don't see any reason to change that." Hodgson said he would be happy to advise the FA over how to improve the game in England if they wanted to talk to him. "I'd be interested to hear their questions and answer them, but I don't put myself forward as somebody who wants to lecture the FA. "But if I was asked that question, I'd make myself available, as any Englishmen would, or as I'm sure any international manager would. "I'd need to be lead down lines by them and asked questions whereby my experience might be put to use." Former AC Milan and Real Madrid coach Fabio Capello is one of the few managers to express an interest in succeeding Steve McClaren, who was sacked last week. But Hodgson hinted the FA could do worse than consider employing a manager or a coach who has had success with a team that did not have the resources of those top clubs. "I know Fabio well and I like him. He's a very good manager and has done it at the big clubs. "But how many managers have managed Real Madrid and AC Milan and not won a championship? "I sometimes think the acid test of a manager is to take a team that has been given no hope and bring them to the championship."